PITTSBURGH, PA - January 31, 2007 - Haley Systems, Inc., the technology leader in business rules management systems, today announced that Oracle has embedded HaleyRules(tm) and HaleyAuthority(tm) as the business rules technology in its recently announced Siebel CRM Release 8. By embedding business rules into Siebel CRM, businesses are able to achieve new levels of cost containment, time-to-market response and long-term competitive advantages. Haley technology is a key part of the Siebel Privacy Management solution within Siebel Universal Customer Master, a comprehensive customer data hub that unifies customer data across multiple business units and functionally disparate systems to provide a trusted authoritative source of customer information across the enterprise. "Providing business users with an easy to use, yet powerful way to define and refine their business rules is a key ingredient to enabling business agility," says Mark Woollen, Vice President of CRM Product Strategy at Oracle. "By leveraging technology from Haley in Oracle's Siebel CRM Release 8, we are able to provide our customers with a high-performance solution that will enable them to define and enforce the rules they need to stay ahead in today's fast paced, ever changing business environment." HaleyAuthority is the multi-user rule authoring application that enables business users to capture, organize, manage and test business rules. It stores rules in a central knowledge management database. Rules files are used by Haley's business rules engine - HaleyRules - the technology-leading business rules inference engine for Java and .NET environments. Haley's business rules technology will give Oracle's Siebel CRM users the ability to customize their business processes and policies. As a premier Oracle partner, Haley also offers optional add-on and plug-in products to enhance the Siebel CRM solution and a broad range of expert professional services including consulting, training and implementation. "The strength of Haley's proven technology, robust lightweight rules engine and unique approach to rules authoring provides business users advanced accessibility and control to capture, manage and review business rules," said Hans Witt, CEO and President of Haley Systems. Interesting article by Andrew Glover at The Disco Blog on how rule engines remove complexity from rules, and as a result simplify the task of programming rules. His example is beer recommendation rules, and that alone will make most of you click here. Did you know that Microsoft has two rule engines? 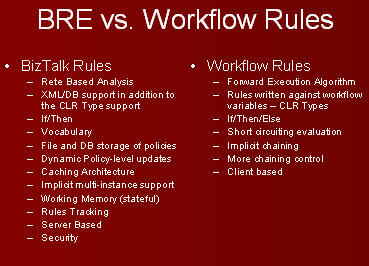 Here is a presentation by Steven Kaufman, Principal Consultant in MCS (Microsoft Consulting Services), comparing Microsoft Workflow Rule Engine and Microsoft BizTalk Business Rule Engine.